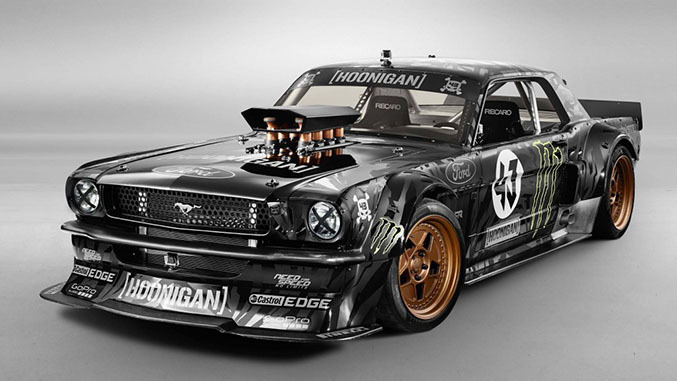 Professional rally driver Ken Block and his Hoonigan racing team have returned with the latest installment of one of the most notorious showcases of tire-destroying mania known to man, Gymkhana. For those unfamiliar with the series, now in its seventh official installment (there’s been a few more that apparently didn’t warrant an entirely new episode number), Gymkhana videos feature high speed stunt driving through some treacherous, often urban environments, with feats of drifting prowess that really must be seen to be believed. This time Ken takes us to the streets in and around downtown Los Angeles, and the weapon of choice is a custom built, all-wheel-drive, 845 horsepower 1965 Ford Mustang coupe. It’s absolutely glorious. For Angelinos like your author, this video is of particular interest simply by virtue of all the great location spotting to be done. From drifting around an abandoned WRX in the LA riverbed to doing donuts around Randy’s Donuts and through the marketplace in Chinatown, there’s an overwhelming sense that Block is living out all of his (and our) Grand Theft Auto 5 fantasies in real life.